What a wonderful news.Congratulations to Christopher and Anna Marie! Aww what joy! Praise the Lord! Congrats! Awwww, congratulations! I hope the “morning” sickness abates soon — reassuring, yes, but hard not to keep hoping it will just stop! We are surely excited for your family! What a blessing! Praise the Lord!That is very exciting news.Congratulations! Praise the LORD for His blessings! What a cute way to share the news 🙂 I’ll be praying daily for both Anna Marie and the baby! Oh wow!! Exciting news indeed! We will certainly keep them in our prayers. Congratulations!Will be praying for Anna Marie as this pregnancy continues. Oh, goodie! Yay! Congratulations, especially to Christopher and Anna Marie. God bless you. Congratulations Christopher and Anna Marie. Praying for you. I’m sure they will be sweet little buddies. Thank you. Yes, Ruthie is really growing up! Congratulations! We had a set of “Irish twins for our second and third children also. Such a joyful time. Praying for health, energy, and all of the help you need to be provided. And be forgiving of yourself if you aren’t able to keep up with housework and things as well as you are used to. It’s only a short season. Congratulations!!!! A new life is such a blessing!!!! With three little ones, Christopher and Anna will be even busier. Oh i am so excited for them… I love it when siblings are close in age. How old is Ruthie? Thanks for keeping us posted! How sweet!! What a blessing! I know your daughters-in-law are very busy and hands on in their homes. I often wonder what it would be like to hear from them on the blog. Maybe for us mamas still in the season of lots of littles to manage?! Yes, life is full for them too ;). What a wonderful birthday gift for Dad. Will be praying for all. Does Dad keep the rattles? What surprising and wonderful news! Congratulations!!! Wow, I am so happy for them! Praying for a wonderful pregnancy and birth! Congratulations!I pray that this will be a safe and healthy delivery for you. Oh, we are so happy for Christopher and Anna Marie!! How exciting! We will pray for baby and mama, and the whole family. Congratulation’s Christopher Anna Marie Joshua and Ruthie!!!! How exciting! Congratulations to the whole family! We will keep Anna Marie in our prayers! Anna Marie loves to work on coordinating outfits. I’ll add Anna Marie to my prayer list. For the nausea and throughout the coming months. Wonderful news. Congratulations to Anna Marie and Christopher! It must be exciting for all to see the next generation of Maxwells increasing in numbers. How exciting! I’m sure that Ruthie will love him or her. Aww congratulations!! That is a great way to surprise y’all! Excited for y’all!! God bless! Congratulations!! New babies are always such a joy! You Ruthanne and the new baby will be a year apart – so does that mean Anna Marie is due in February? 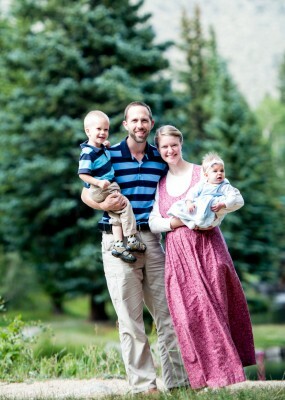 Oh 3 babies under 3, Christopher and Anna Marie have their work cut out for them, but the Lord always provides! Yes, due date is in February. They are very excited! Congratulations! What wonderful news! I will pray for Christoper and Anna Marie. More congratulations to the Maxwell family! Lovely news! CONGRATULATIONS!!! 🙂 Am praying for Anna Marie and the new Baby Maxwell. Such an exciting time for you all! Thanks. Yes, we are so excited. God is good! Congratulations! That is a wonderful gift to give the rattle, and a marvelous, wondrous gift from the Lord to have a baby! Congratulations! So happy for them. I love it when brothers/sisters are close in age. I believe that they are closer(best friends) in the long run than when they are spread apart with many years in between. Did you all have any idea before Anna Marie gave the rattle as a present? As soon as we saw the rattle, the cheering began!!! We were completely shocked–no ideas ;). ahhhh, how did I miss this exciting news?! Congratulations. We will be covering them in prayer!